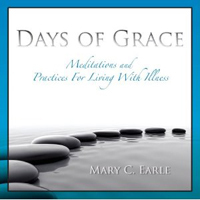 “Days of Grace: Meditations and Practices for Living with Illness” (2 CDs) written by Mary C. Earle with music by Ben B. King from his album ” A Laying On Of Songs: Healing Guitar Melodies from America’s Gospel Heritage”. These 30 meditations are inspired by the Psalms. Each meditation is followed by suggestions for practices that will enrich and enhance the meditations. Earle, who suffers from chronic pancreatitis, suggests that chronic illness or disability might be a condition filled with grace as well as pain, with Christ’s presence as well as fear. For more information, see: http://www.marycearle.org. SKU: 978-0-9798958-9-0. Categories: Audio Books, Ben King, Mary C. Earle. Tags: Audio Book, Days of Grace, Mary C. Earle, Meditations, Psalms.